When money is borrowed, interest is typically paid to the lender as a percentage of the principal, the amount owed. The percentage of the principal that is paid as a fee over a certain period of time (typically one month or year), is called the interest rate. A bank deposit will gain interest because the bank is paying for the use of the deposited funds. Assets that are sometimes lent with interest include money, shares, consumer goods through hire purchase, major assets such as aircraft, and even entire factories in finance lease arrangements. The interest is calculated upon the value of the assets in the same manner as upon money. Interest is compensation to the lender, for a) risk of principal loss, called credit risk; and b) forgoing other useful investments that could have been made with the loaned asset. These forgone investments are known as the opportunity cost. Instead of the lender using the assets directly, they are advanced to the borrower. The borrower then enjoys the benefit of using the assets ahead of the effort required to obtain them, while the lender enjoys the benefit of the fee paid by the borrower for the privilege. In economics, interest is considered the price of credit. Interest is often compounded, which means that interest is earned on prior interest in addition to the principal. Compound interest grows at an exponential rate and its mathematical study led to the discovery of the number e.
In ancient biblical Israel, it was against the Law of Moses to charge interest on private loans. During the Middle Ages, time was considered to be the property of God. Therefore, to charge interest was considered to be commerce with God's property. Also, St. Thomas Aquinas, the leading theologian of the Catholic Church, argued that the charging of interest is wrong because it amounts to "double charging", charging for both the thing and the use of the thing. The church regarded this as a sin of usury; nevertheless, this rule was never strictly obeyed and eroded gradually until it disappeared during the industrial revolution. Usury has always been viewed negatively by the Roman Catholic Church. The Second Lateran Council condemned any repayment of a debt with more money than was originally loaned, the Council of Vienna explicitly prohibited usury and declared any legislation tolerant of usury to be heretical, and the first scholastics reproved the charging of interest. 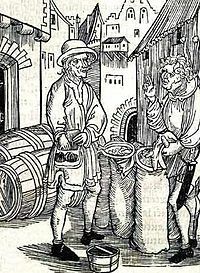 In the medieval economy, loans were entirely a consequence of necessity (bad harvests, fire in a workplace) and, under those conditions, it was considered morally reproachable to charge interest. It was also considered morally dubious, since no goods were produced through the lending of money, and thus it should not be compensated, unlike other activities with direct physical output such as blacksmithing or farming. As Jewish citizens were ostracized from most professions by local rulers, the church and the guilds, they were pushed into marginal occupations considered socially inferior, such as tax and rent collecting and moneylending. Natural tensions between creditors and debtors were added to social, political, religious, and economic strains. ...financial oppression of Jews tended to occur in areas where they were most disliked, and if Jews reacted by concentrating on moneylending to non-Jews, the unpopularity — and so, of course, the pressure — would increase. Thus the Jews became an element in a vicious circle. The Christians, on the basis of the Biblical rulings, condemned interest-taking absolutely, and from 1179 those who practiced it were excommunicated. Catholic autocrats frequently imposed the harshest financial burdens on the Jews. The Jews reacted by engaging in the one business where Christian laws actually discriminated in their favor, and became identified with the hated trade of moneylending. Interest has often been looked down upon in Islamic civilization as well for the same reason for which usury was forbidden by the Catholic Church, with most scholars agreeing that the Qur'an explicitly forbids charging interest. Medieval jurists therefore developed several financial instruments to encourage responsible lending. The first formal studies of interest rates and their impact on society were conducted by Adam Smith, Jeremy Bentham and Mirabeau during the birth of classic economic thought. In the early 20th century, Irving Fisher made a major breakthrough in the economic analysis of interest rates by distinguishing nominal interest from real interest. Several perspectives on the nature and impact of interest rates have arisen since then. The latter half of the 20th century saw the rise of interest-free Islamic banking and finance, a movement that attempts to apply religious law developed in the medieval period to the modern economy. Some entire countries, including Iran, Sudan, and Pakistan, have taken steps to eradicate interest from their financial systems entirely. Rather than charging interest, the interest-free lender charges a "fee" for the service of lending. As any such fee can be shown to be mathematically identical to an interest charge, the distinction between "interest-free" banking and "for-interest" banking is merely semantic. and he would have to pay $2581.19 to pay off the balance at this point. His balance at the end of 3 months would still be $2500. Corporate bond where the first $3 are due after six months, and the second $3 are due at the year's end: (3+3)/100 = 6%/year. where Icomp is the compound interest, B0 the initial balance, Bm the balance after m periods (where m is not necessarily an integer) and r the period rate. So, at the end of 3 months the credit card holder's balance would be $2582.07 and he would now have to pay $82.07 to get it down to the initial balance. Simple interest is approximately the same as compound interest over short periods of time, so frequent payments are the least expensive repayment strategy. A problem with compound interest is that the resulting obligation can be difficult to interpret. To simplify this problem, a common convention in economics is to disclose the interest rate as though the term were one year, with annual compounding, yielding the effective interest rate. However, interest rates in lending are often quoted as nominal interest rates (i.e., compounding interest uncorrected for the frequency of compounding). Loans often include various non-interest charges and fees. One example are points on a mortgage loan in the United States. When such fees are present, lenders are regularly required to provide information on the 'true' cost of finance, often expressed as an annual percentage rate (APR). The APR attempts to express the total cost of a loan as an interest rate after including the additional fees and expenses, although details may vary by jurisdiction. In economics, continuous compounding is often used due to its particular mathematical properties. Commercial loans generally use simple interest, but they may not always have a single interest rate over the life of the loan. Loans for which the interest rate does not change are referred to as fixed rate loans. Loans may also have a changeable rate over the life of the loan based on some reference rate (such as LIBOR and EURIBOR), usually plus (or minus) a fixed margin. These are known as floating rate, variable rate or adjustable rate loans. Combinations of fixed-rate and floating-rate loans are possible and frequently used. Loans may also have different interest rates applied over the life of the loan, where the changes to the interest rate are governed by specific criteria other than an underlying interest rate. An example would be a loan that uses specific periods of time to dictate specific changes in the rate, such as a rate of 5% in the first year, 6% in the second, and 7% in the third. Here, it is the nominal interest at the time of the loan, r(t + 1) is the real interest expected over the period of the loan, π(t + 1) is the inflation expected over the period of the loan and σ is the representative value for the risk engaged in the operation. The calculation for cumulative interest is (FV/PV)-1. It ignores the 'per year' convention and assumes compounding at every payment date. It is usually used to compare two long term opportunities. US and Canadian T-Bills (short term Government debt) have a different calculation for interest. Their interest is calculated as (100-P)/P where 'P' is the price paid. 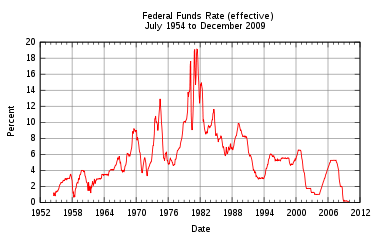 Instead of normalizing it to a year, the interest is prorated by the number of days 't': (365/t)*100. (See also: Day count convention). The total calculation is ((100-P)/P)*((365/t)*100). This is equivalent to calculating the price by a process called discounting at a simple interest rate. Since the lender is deferring his consumption, he will at a bare minimum, want to recover enough to pay the increased cost of goods due to inflation. Because future inflation is unknown, there are three tactics. Charge X% interest 'plus inflation'. Many governments issue 'real-return' or 'inflation indexed' bonds. The principal amount or the interest payments are continually increased by the rate of inflation. See the discussion at real interest rate. Decide on the 'expected' inflation rate. This still leaves both parties exposed to the risk of 'unexpected' inflation. Default interest is the interest that a borrower would pay if he/she will not fulfill the loan covenants. The default interest is usually much higher than the original interest since it is reflecting the aggravation in the financial risk of the borrower. The default interest compensates the lender for the added risk. Charging interest equal only to inflation will leave the lender with the same purchasing power, but he would prefer his own consumption sooner rather than later. There will be an interest premium of the delay. He may not want to consume, but instead would invest in another product. The possible return he could realize in competing investments will determine what interest he charges. Shorter terms have less risk of default and inflation because the near future is easier to predict. Broadly speaking, if interest rates increase, then investment decreases due to the higher cost of borrowing (all else being equal). Interest rates are generally determined by the market, but government intervention - usually by a central bank- may strongly influence short-term interest rates, and is used as the main tool of monetary policy. The central bank offers to buy or sell money at the desired rate and, due to their control of certain tools (such as, in many countries, the ability to print money) they are able to influence overall market interest rates. Open market operations are one tool within monetary policy implemented by the Federal Reserve to steer short-term interest rates. Using the power to buy and sell treasury securities, the Open Market Desk at the Federal Reserve Bank of New York can supply the market with dollars by purchasing T-notes, hence increasing the nation's money supply. By increasing the money supply or Aggregate Supply of Funding (ASF), interest rates will fall due to the excess of dollars banks will end up with in their reserves. Excess reserves may be lent in the Fed funds market to other banks, thus driving down rates. It is increasingly recognized that the business cycle, interest rates and credit risk are tightly interrelated. The Jarrow-Turnbull model was the first model of credit risk that explicitly had random interest rates at its core. Lando (2004), Darrell Duffie and Singleton (2003), and van Deventer and Imai (2003) discuss interest rates when the issuer of the interest-bearing instrument can default. It is thought that Jacob Bernoulli discovered the mathematical constant e by studying a question about compound interest. He realized that if an account that starts with $1.00 and pays 100% interest per year, at the end of the year, the value is $2.00; but if the interest is computed and added twice in the year, the $1 is multiplied by 1.5 twice, yielding $1.00×1.5² = $2.25. Compounding quarterly yields $1.00×1.254 = $2.4414…, and so on. To find the payment if the loan is to be paid off in n payments one sets Bn = 0. The formulas for a regular savings program are similar but the payments are added to the balances instead of being subtracted and the formula for the payment is the negative of the one above. These formulas are only approximate since actual loan balances are affected by rounding. To avoid an underpayment at the end of the loan, the payment must be rounded up to the next cent. The final payment would then be (1+r)Bn-1. which is less than r if n>1. ^ Sullivan, arthur; Steven M. Sheffrin (2003). Economics: Principles in action. Upper Saddle River, New Jersey 07458: Pearson Prentice Hall. pp. 506. ISBN 0-13-063085-3. http://www.pearsonschool.com/index.cfm?locator=PSZ3R9&PMDbSiteId=2781&PMDbSolutionId=6724&PMDbCategoryId=&PMDbProgramId=12881&level=4. Duffie, Darrell and Kenneth J. Singleton (2003). Credit Risk: Pricing, Measurement, and Management. Princeton University Press. ISBN 13 978-0691090467. Kellison, Stephen G. (1970). The Theory of Interest. Richard D. Irwin, Inc.. Library of Congress Catalog Card No. 79-98251. Lando, David (2004). Credit Risk Modeling: Theory and Applications. Princeton University Press. ISBN 13 978-0691089294.
van Deventer, Donald R. and Kenji Imai (2003). Credit Risk Models and the Basel Accords. John Wiley & Sons. ISBN 13 978-0470820919. This page was last modified on 26 April 2011 at 13:42.